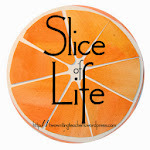 It's hard to believe that today is the the final day of the Slice of Life Challenge. In reflection, this year I did a few more "slices" than last year, but didn't come close to my goal in the beginning of writing a slice a day. Thanks to Stacey and Ruth for hosting this challenge once again. It's been a lot of fun both writing mine and reading others. I am sitting here at a table that looks out over a lagoon, two pools, amazing landscaping, and the ocean sitting about 100 yards away. The tide keeps rolling in, one wave at a time. It is another brilliantly sunny, though cool, morning without a cloud in the sky. My goal this morning is to write a few blog posts and stockpile some reviews of children's books for later. The bad news about that goal is that it has been my goal every day since we've been in Hilton Head. My original plan is that I would get up and write for two hours every day. I imagined being a prolific writer away from the hustle and bustle of my daily work life. But what I've learned about myself in the past four days is, that when I'm looking out at the view described above, I can't focus. I find myself thinking about the bike ride I'll be taking soon, wondering which book I want to read today, wanting to Google when high tide will be because I'll probably go down to the beach after that, thinking about which bathing suit to wear today, thinking about what seafood restaurant we should go to for dinner tonight, looking at the people on the beach and wondering where they're from and how long they've been biking, walking, or jogging. Like I said -- a real focus problem here!! So, I guess the solution is I need to wrap up my writing, Google high tide, pick a book, and go take that bike ride in the near future. The rest can just unfold in my very unscheduled and unorganized day. Aren't vacations wonderful?!!! I think I was meant to live near water. As soon as we got to Hilton Head yesterday, I walked out to the beach, took off my shoes, and immediately relaxed. It was very chilly and overcast, but that was okay. The important thing was the sound of the waves, the feel of the sand beneath my toes, the ocean breeze (a very cold, stiff breeze yesterday) - those are the sensations that matter so much. Today, I woke up around 6 AM, and just waited for the sun to come up. Our condo faces east, so it was a perfect opportunity to catch the beginning of the day. The weather this morning and again in the early afternoon was much different than yesterday's weather. The sun was shining brightly, there was a breeze, I had a great book to read, and the ocean view was stunning. A different side to the Hilton Head ocean, but again, I am totally relaxed. Spring break actually began after school yesterday afternoon about 3:45 PM, but since I still had errands to do, lesson plans to prepare, laundry to wash, and no packing had even begun, I didn't think of spring break starting until this morning. This morning, I woke at 6:00 AM excited to shower, put my last personal stuff in a bag, and get on the road to Hilton Head. Before I jumped in the shower, I looked out the window, and much to my surprise, could see a thick layer of ice covered with 2 - 3 inches of snow everywhere. I had my flip-flops out to wear because that's what I do when I'm headed to a warmer climate; I dress the way I plan to be dressed when I get there. Thus, flip-flops were going to be part of my attire. I guess some "rules" are meant to be broken though, because even with the fantastic pedicure I just received and my toenails looking ever so lovely, I just couldn't put on flip-flops. What a difference 525 miles can make! The entire day, we drove through rain and sleet, with the temperature never rising above 32 degrees. It was that way in Ohio, in West Virginia, and through Virginia as we traveled down Interstate 77. Then, as we drove into North Carolina, our outside thermometer started to move upward. By the time we stopped for the evening in Columbia, South Carolina, it had reached 67 degrees. Needless to say, I am now currently in my flip-flops as I write this and when we hit the road tomorrow to finish the last few hours to Hilton Head, I will be dressed for the warmer climate again. So excited to be on spring break, warmer weather and all!! We held our third and final Grand Discussion of the year last Thursday with about 50 or so people attending. If you've been reading Literate Lives, you know our first two discussions involved books with some pretty serious messages, so, in order to lighten things up a little bit, we chose Newbery Honor book The Mostly True Adventures of Homer P. Figg. Clearly the book is not a laugh out loud sort of story, but it does have some entertaining and humorous parts to it. I mean, come on, that amazing pig boy part is FUNNY! or so I thought, however, about a third of our group didn't agree and found the book to be very sad. Several were also upset at the name calling and abusive treatment from the boys' uncle in the beginning. All good points, but overall, I think most of us agreed that this book was not quite as heavy as the first two choices, Bystander and Also Known as Harper. And speaking of Also Known as Harper, an unexpected result came out of the Grand Discussion we held for the book. I think I've said before that my school is very fortunate. We have plenty of resources, supportive parents, capable students and a beautiful facility. I feel very lucky every morning I come to school and get to teach in the incredible library at Bailey Elementary. During our discussion of Also Known as Harper, my sister and the librarian from her school came to see how the whole Grand Discussion thing works with thoughts of possibly doing a similar program at their school. The school where they teach is about the exact opposite of Bailey. While the students do amazing things both on state tests and day to day work, the surroundings are not the same and their students come from a very different background. My sister shared some things about their school and the kids, and how the book hits pretty close to home for some of her students. It was an emotional moment for all in the room and it had an impact on the parents and students attending. I had no idea how much of an impact until the next day when I was contacted by one of the moms who told me that they would like to organize the kids into action. They wanted to take on the task of raising money to buy books for the library at my sister's school. The kids wanted to take the lead on promoting the event and they wanted to make sure that the Bailey kids understood that this money needed to come from them, not their parents, them. I was thrilled and met with a group of parents after speaking with Martha and we began planning. It's turned into more than a fund raiser, we are now talking about making this an ongoing thing, sort of making Bailey and Lincoln Elementary schools, sister schools. Each of taking care of the other in the ways that we are able. There has been talk of pen pals, and video conferencing, some sort of an exchange program and inviting kids from our sister school down for special events in the future. Who knows where this will go from here, but it's an exciting time at Bailey as the fifth graders are wrapping up two weeks of Coins 4 Kids to raise money for the Lincoln Elementary School library. I'm looking forward to making this program grow and hopefully I'll be posting a lot more about the kids from Bailey and our sister school Lincoln Elementary! Slice of Life - Glad that 48 hours is over! This past Monday, my husband had a simple outpatient procedure done in his doctor's office. I took the afternoon off to be his transportation and support, and everything seemed to be going well. Now, I'm not going to generalize about all men, but my husband can sometimes build his illnesses into something more than they really are. So, when he started moaning and complaining about how much pain he was in the next day, I am embarrassed to say it pretty much went in one ear and out the other. Not painting a very pretty picture of myself, am I? Well, it gets worse. Turns out he was one of the 1% of people who get a specific infection caused by massive bacteria from his procedure. Thursday night, I finally took him to the emergency room (still thinking this was a lot ado about nothing), only to have the emergency room doctor tell me about the bacteria and how serious this really was. Wow! Talk about feeling bad for all my thoughts and reactions to his moaning and groaning for the past three days. The icing on the cake was that my husband was so ill, he had to be admitted to the hospital for over 24 hours. So, I probably won't earn Wife of the Year Award, but I will definitely be more willing to listen and be compassionate the next time my husband tells me he feels like heck. Glad that 48 hours is over!! I can't speak for all females, but for this particular one, one of my all-time favorite days is the day I go to a hair appointment. It is two hours of pure bliss. From the conversation between my stylist and me as we decide what direction to go with my hair on that particular day, to the color weaving where I actually fall asleep on the last row because of the massage-like feel of the repetitive gentle tugs on my scalp as she applies the color and the foils, to sitting in the quiet area of the salon with a hot chocolate and a book to read as my color processes, to the massage on my scalp during the shampoo and conditioner, and finally to the cut and style -- for two solid hours, it's all about me. All of those wonderful things occurred for me tonight, starting at 4:15. I LOVE my hair day!!! Tonight I had the pleasure of dining with a student from my school that had won my Teacher Time raffle of dinner at Max and Erma's with me and one of his friends. The student that won was actually one of my students, and the friend he chose was from my class as well. It was a hoot being in a different environment with these two boys. They were totally entertaining; I felt like maybe there was a role reversal. I was having so much fun I thought maybe I had won the prize. The night that worked the best for both my schedule and the students' schedules turned out to be a Tuesday night. Imagine my surprise (and a little embarrassment) when I realized that Tuesday night at Max and Erma's was "Kids Eat Free" night. The boys, M and J, got quite a kick out of that situation. Because I felt so bad about not having to pay for their meals, after dinner we wandered over to the neighboring Graeter's ice cream, and I treated them to an ice cream treat of their choice. If they were excited before, they were over the moon with their dessert. But, my favorite part of the evening was when I dropped off M (the actual winner) at his house, and he thanked me profusely for such a great night. He couldn't believe how quickly 2 hours had flown by (to be honest, neither could I)!! My take-away from the evening is a no-brainer -- there is always more to our students than we see in the short time we spend with them at school. Tonight, I got an upclose and personal look at two people and I found I was delighted with what I saw. As I drove home, I wondered who the real winner of my teacher time raffle was -- M or me? This past Wednesday, I had a very full day at school, followed by a buffet and a variety show with my father-in-law at his retirement home. After dinner, while we were waiting for the entertainment to begin, we decided to take a short car ride to our home from the retirement village. My father-in-law and I sat down to watch the news together. While we were sitting there, I got a text message from one of my daughters. I started to text back my reply. The next thing I knew, my father-in-law was tapping me on the shoulder to see if I was okay. I had fallen asleep texting. Now, that's tired!! It was brought to my attention recently that I never blogged about the recent Lit Conference held here in Dublin in February. I felt really bad about that because that particular day was an amazing day for me. So my "slice" for today will be a quick synopsis of some of the wonderful learning that took place for me the day of the Dublin Literacy Conference.
" School can be anything you can imagine. Empowering human potential is the job of an educator. We should constantly be revising and editing our thinking." He said much more; this is just the tip of the iceberg. He ended his keynote by sharing a video created by 7th graders in his school that celebrated the achievement and talents of a classmate. The video was powerful and brought tears to my eyes. In addition, the thinking, collaboration, and creating that went into this video was awe-inspiring. I then later heard Dr. Tyson speak in a smaller group setting. His vision of where technology can go in education took my breath away! I was glad that I was sitting right behind my principal during this session. There were some ideas we floated by one another that we would like to see in our building. Lots of ideas; now we have to work on the funding. Ann Marie Corgill: I went to hear Ann Marie (author of Of Primary Importance) speak for one of my sessions. Ann Marie used to teach in the primary grades, but has recently moved into a 6th grade position. What I loved about her talk is that it re-emphasized for me that good literacy instruction looks similar whether you are working with primary students or 6th graders. Other important take-aways from her session were 1) the idea of keeping a "teaching point" notebook, 2) using share time to have students share what they learned during their conference or in strategy group, 3) using a Writing Journey Folder that contains the entire history of a piece, 4) how great her students' BIG published projects were, and 5) how important honoring children is everyday. Later on in the day, I got to spend some one-on-one time with Ann Marie which was wonderful as well. We spent some time looking at the tech projects some students in our district have created, we spent some time watching Kevin Hodgson work his stop-motion magic with a large group of students that had signed up for his session, and we also spent some quiet time just chatting in the teachers' lounge (we also nibbled, okay gobbled, some of the best sugar cookies I have ever had). Finally, the part of the conference that is always fun for me is when Bill (my blog partner) and I shared some of the best new books of 2009 with other teachers. We always have a blast together and the session just flowed naturally back and forth between us as we shared our favorites. When you get to spend an entire day thinking, reflecting, and being challenged about what is best practice for our students, that is a great day!! Add to that the opportunity to spend time with so many smart people. I am so lucky that the Dublin Literacy Conference is in my own school district!! A few weeks ago a third grade teacher sent me an email looking for "literary non-fiction." Confession time, I've never been into the teacher lingo, and am not always up on the current terms for things, so I had to go to my friend Maria for a definition. She described it as a non-fiction book that is written like a story, now that's a definition I can understand, and amazingly, I was a big fan of these kinds of books as a kid. I also realized that literary non-fiction is what Karen and I screened for the CYBILS this year. 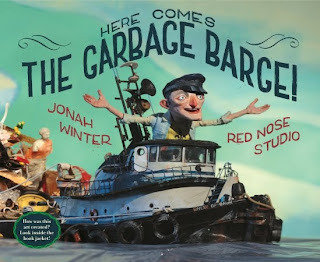 However, one that we didn't screen, that I just discovered on a recent trip to Cover to Cover is Here Comes the Garbage Barge written by Jonah Winter. Remember the story of the barge from New York that traveled all over 6000 miles looking for a home? It was all over the television and newspapers in 1987. Comics were getting big laughs talking about the little tug boat named Break of Dawn pulling over 3100 tons of Islip, New York's smelliest leftovers from NYC to Mexico to Belize and back again. When it arrived back in Islip, they refused their own garbage! You can't make this stuff up! So Jonah Winter takes this news story and turns it into a fun story with illustrations by Red Nose Studio. Each harbor from North Carolina to New Orleans to Florida has it's own personality shown both in the illustrations and Winter's brief descriptions. For example, Florida is describes as "The Sunshine State, home of alligators, beautiful beaches and grandparents." A large number of my students say, "Hey, my grandparents are in Florida!" and then laugh at the old guy floating in his ducky tube in the ocean shaking his fist at the garbage barge. Very funny! As the barge gets turned away in port after port, and finally ends up back in Islip, NY, the kids are always disgusted and surprised when the city who created the garbage actually has the nerve to turn it away. Of course, justice is served, when the trash is incinerated in Brooklyn and buried in land fills in Islip, and the kids leave with a feeling of closure, but also disbelief that this is actually a true story. Great writing and awesome artwork make this fun read aloud in THE PIT! I found this awesome You Tube video on the making of the illustrations, way cool! My husband and I are huge fans of a family run local pizza place called Enrico's. When our daughters were still living at home, we used to pick the pizza up, bring it home, and everyone would eat it wherever it might fit in their Friday night schedule. Tonight, as we headed out to get our Friday night pizza fix, I reflected on how things have changed. Now when we want pizza on a Friday night, we drive over together and eat at Enrico's. Very small retail space, smoky with the hundreds of pizzas that are baked nightly, tables close together, first come first serve seating, parking a nightmare on a Friday night. But the pizza is just that wonderful that all those minor annoyances aren't even worth worrying about. As the owner who works the cash register greeted us, the 3 grandparents who work in the kitchen waggled the fingers hello as we came in, and we looked around the restaurant and noticed many people we normally see there on Friday night, we realized that we have become "regulars". We walked in, found a table, and because we are regulars, our drinks of choice showed up quickly. Depending on who our waitress is for the evening, determines whether or not they even bother to hand us menus. It's become a ritual that is very relaxing. It gives my husband and me an opportunity to catch up with each other on what happened that day, discuss what the plans are for the weekend, and most importantly relax and unwind. Tonight, by the time we had eaten our house salads, I noticed a considerable lessening of tension in my husband (I was pretty relaxed already because I had the day off today). By the time we got our second beverages and were starting to eat our small pizza, life was good. Small pleasures like Pizza Friday at Enrico's make me very happy. I find myself reflecting on blessings this evening. I just returned from a double baby shower with people I used to spend a lot of time with and it was truly wonderful. I am blessed that I had an opportunity to work with such smart people for two years of my life. I grew so much professionally at that time. I am blessed that I still spend time with some of them even though we are now all in different positions. I am blessed that the colleagues I don't see as often were able to make it tonight. It was a feeling of coming together that felt so right. I am blessed that in this group of friends, we all have different strengths that make us better as a collective whole. I am blessed with the gift of laughter, gossip, and merriment when I am with these people. And last, but not least, I am blessed that one of the colleagues has a friend that bakes an excellent cake! Though I love the independence my husband and I have found in this first year of being empty nesters, I also love when either (or both) of the girls come home and one of the first things they do is request a special dish or meal that I cook. Tonight, my youngest daughter asked for my special meatloaf (don't scoff - it's fabulous! ), REAL mashed potatoes (as opposed to the kind Bob Evans makes? ), and green beans sauteed in olive oil. Not one of the items is difficult to make, but I found myself in the kitchen for over three hours. Not only do I love preparing a meal they want, but I love the rhythm and the solace of the preparation. Peeling and cutting potatoes, mixing the ingredients for the meatloaf, mixing the ingredients for the sauce that goes on the meatloaf, cleaning and sauteeing green beans -- all these things allow me time for reflection and to feel gratitude for the fact that the house is buzzing with youthful energy again. Tonight, as the smells started to waft their way through the house, my youngest daughter finally made an appearance sniffing the air in anticipation. I know I should probably bring her into the kitchen and teach her these simple recipes, but for this one night, this is a gift I can prepare and give to her. The genuine appreciation she showed at the end of our meal tonight was the gift for me. After worrying that we wouldn't be able to reach our destination of Washington D.C. to see our oldest daughter (see yesterday's S.O.L. ), I am happy to report that we made it! This weekend was everything that a mother of a post-college age child could want. Kate, our oldest daughter, moved to Washington D.C. last September. When she moved there, she didn't have a job or a place to call her own. Luckily, she had great friends that allowed her to bunk with them until almost Thanksgiving. Fast forward a little more than 5 months. We arrived in D.C. this weekend to find the following: she lives in a townhome in a great neighborhood with some nice roommates, and she has been hired as an intern to work in the Office of Foreign Affairs. In her short stint there (she's only been working 4 weeks so far), she has met every Representative that serves on this committee, she has met our Vice-President, and just this past week she met, and had her picture taken with, the Secretary of State. If you're a twenty-something living in D.C., how cool is that?!! Unfortunately, intern translates into "unpaid" so her hope is to move into a paid position in the near future. For now, she lives off the money she makes working two other jobs. She is quite busy, but incredibly happy. She somehow has managed to see her high school, college, and study abroad friends that live in D.C., as well as establishing new groups of friends. As she showed her sister, her dad, and me around the town that she is proud to now call her home, it was a delight to watch her poise and self-confidence. From the minute we saw her, I was taken aback by how she is just standing taller and prouder. Sure, seeing the monuments and sightseeing was fun, but it was watching how Kate has blossomed into a confident young woman that was truly the highlight of my weekend. Well, I'm going to try to join the Slice of Life Challenge again this year. If I stay true to form, I will get a few "slices" in a week, but I'm not sure I'll get a post up every day. However, I love that Ruth and Stacey at Two Writing Teachers host this. Thanks, ladies! SOLC: Mar. 1 - This weekend my youngest daughter started her college spring break. She came home to very cold and snowy weather, but she was delighted that she, my husband, and I were immediately jumping in the car to travel to Washington D.C. to see her sister (our oldest daughter). As we packed the car full of all the things necessary for a 7 hour car trip (one way) and a weekend in D.C., we were laughing, excited, and full of high expectations for the family weekend that lie ahead. I was taken back to the many years of carpooling as we began our trip -- adults in the front seat, children chattering away in the back. My child may now be 19 years old, going on twenty-something, but give her the backseat, and she has a million things to tell us. I love that some things never change! Over three hours into our drive, and the snow and wind really started to pick up, and the interstate became slightly treacherous. Instead of trying to drive all the way through to D.C., we decided to stop at the nearest hotel for the night. We got off at one of the exits in Morgantown, West Virginia, and chose to get something to eat first. As we sat in our booth at the restaurant, relaxed and thrilled to be off the road, we noticed a group of young people about our daughter's age sit down at the booth behind us. We couldn't help but overhear their conversation with the waitress. They told her that they were stranded on their way home to Maryland because Interstate 68 had been closed. OMG! That was our road. We were filled with mixed emotions -- delight that we got off before we were sitting in traffic due to the closure, and worry that the road might not be reopened tomorrow morning when we are ready to get to our other daughter. For now, we are resigned to the "whatever happens, happens" mantra. We are in our hotel room, sharing some fun moments with our youngest, biding our time until bedtime. We watched last night's Survivor episode on our daugher's computer, my husband has now found a basketball game on the television, I have found a wifi connection and am doing some online wandering, and our youngest has decided to avail herself of the fitness room downstairs. We're inside, we've been fed, and we have shelter for the night. For that, I feel fortunate. We'll see what tomorrow will bring.